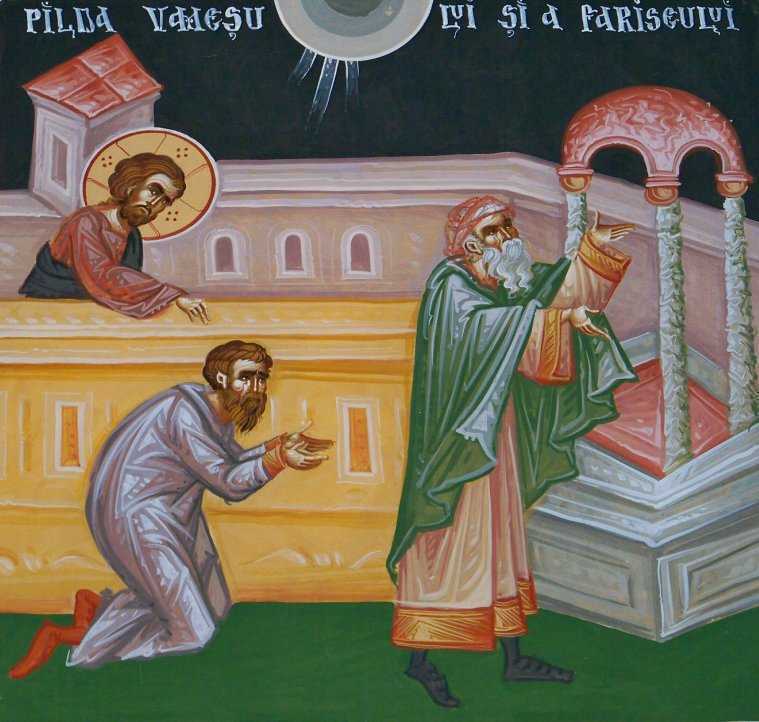 The Sunday after the Sunday of the Publican and the Pharisee is the Sunday of the Prodigal Son. 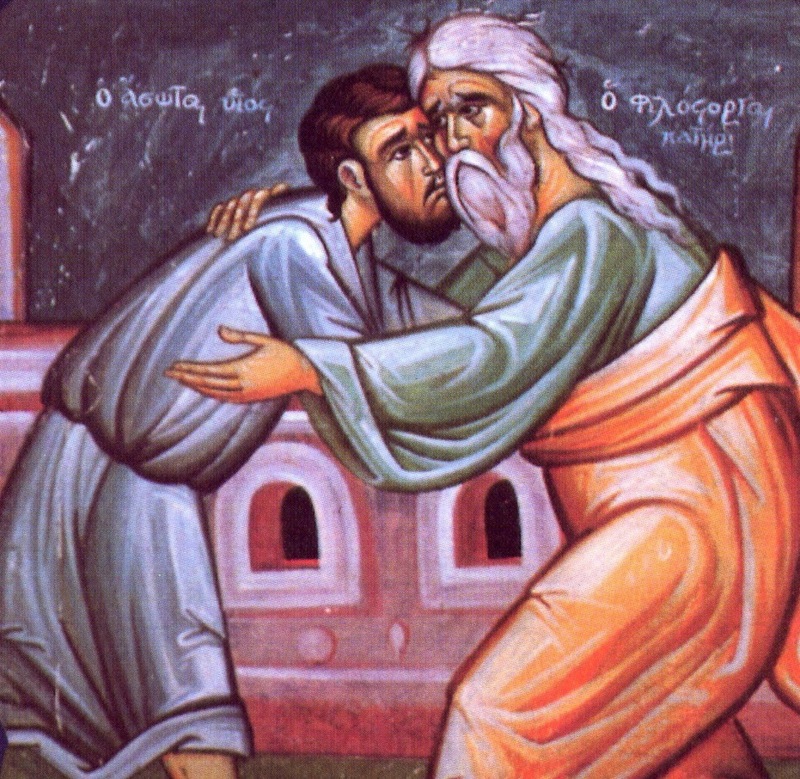 This parable of God’s forgiveness calls us to “come to ourselves” as did the prodigal son, to see ourselves as being “in a far country” far from the Father’s house, and to make the journey of return to God. We are given every assurance by the Master that our heavenly Father will receive us with joy and gladness. We must only “arise and go,” confessing our self-inflicted and sinful separation from that “home” where we truly belong (Luke 15:11-24). In 528, during the reign of Justinian, an earthquake killed many people in Antioch. Other misfortunes followed this one. In 541 a terrible plague broke out in Constantinople, carrying off several thousand people each day. During this time of widespread suffering, a solemn prayer service (Litia) for deliverence from evils was celebrated on the Feast of the Meeting of the Lord, and the plague ceased. In thanksgiving to God, the Church established a more solemn celebration of this Feast. 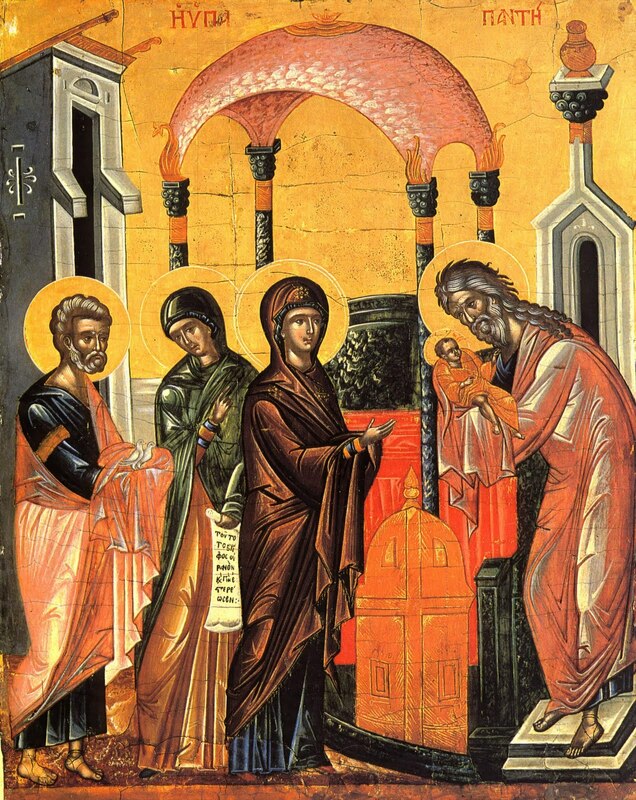 On this day we also commemorate the icon of the Most Holy Theotokos known as “the Softening of Evil Hearts” or “Simeon’s Prophecy.” The Mother of God is depicted without Her Child, with seven swords piercing her breast: three from the left side, three from the right, and one from below. A similar icon, “Of the Seven Swords” (August 13) shows three swords on the left side and four from the right. 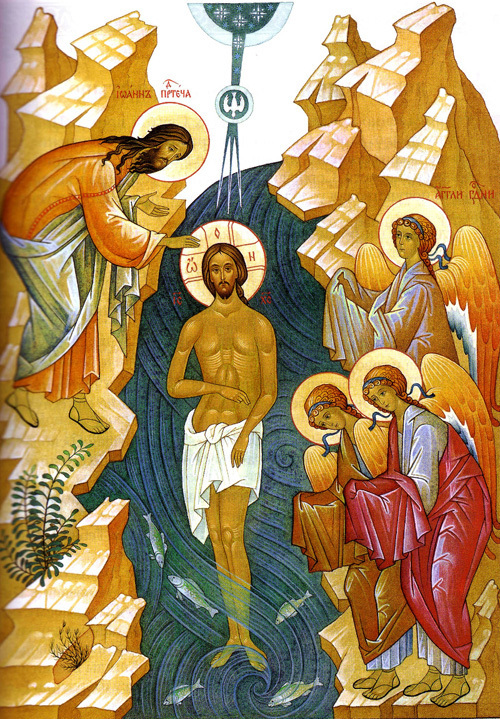 When You, O Lord were baptized in the Jordan, the worship of the Trinity was made manifest. For the voice of the Father bore witness to You, and called You His beloved Son. And the Spirit, in the form of a dove, confirmed the truthfulness of His word. 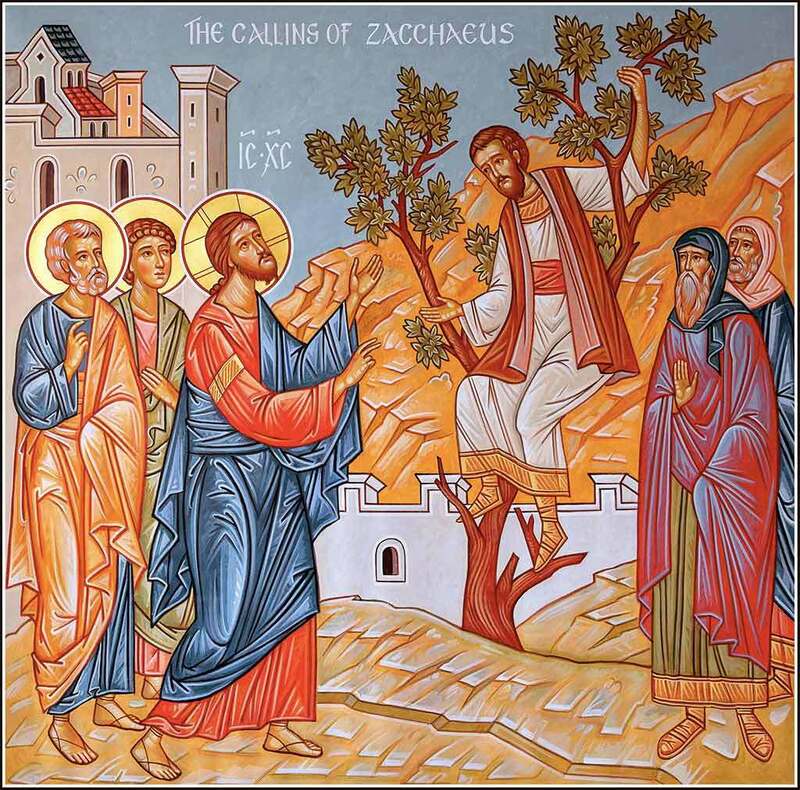 O Christ, our God, You have revealed Yourself, and have enlightened the world, glory to You! The early Christians buried Stephen in a small chapel in Jerusalem, which was dedicated to his memory and was known as the chapel of St. Stephen the Protomartyr (First Martyr). 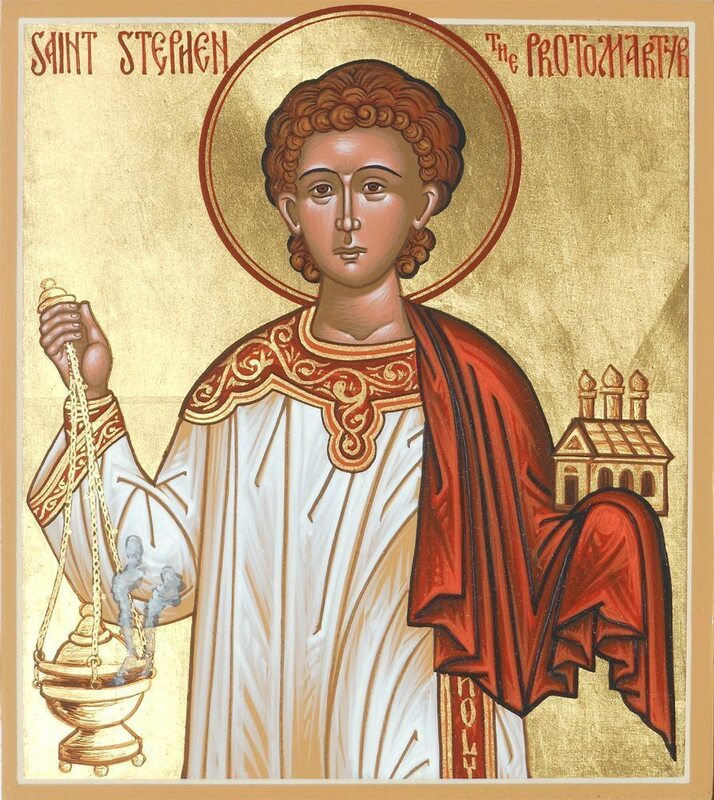 Because of all you have endured for Christ our God, you have been given a royal crown, O First and Holy Martyr Stephen! You have put your persecutors to shame and have seen your Saviour enthroned at the right hand of the Father. Do not cease to intercede for the salvation of our souls. But when the fullness of the time had come, God sent forth His Son (Galatians 4:4) to save the human race. And when nine months were fulfilled from the Annunciation, when the Archangel Gabriel had appeared to the Most-holy Virgin in Nazareth, saying, Rejoice, thou that art highly favoured … behold, thou shalt conceive in thy womb, and bring forth a Son (Luke 1:28, 31), at that time there went forth a decree from Caesar Augustus that all the people of the Roman Empire should be taxed. In accordance with this decree, everyone had to go to his own town and be registered. That is why the righteous Joseph came with the Most-holy Virgin to Bethlehem, the city of David, for they were both of the royal lineage of David. 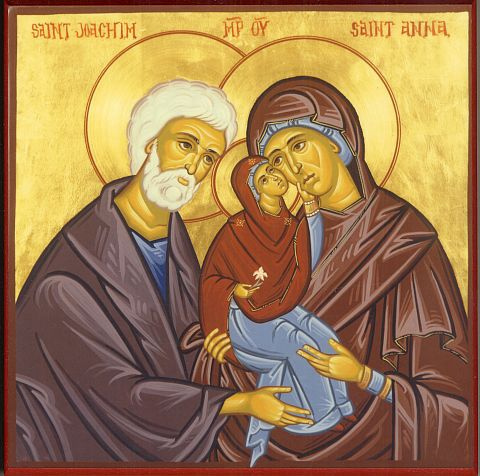 Since many people descended on this small town for the census, Joseph and Mary were unable to find lodging in any house, and they sought shelter in a cave which shepherds used as a sheepfold. 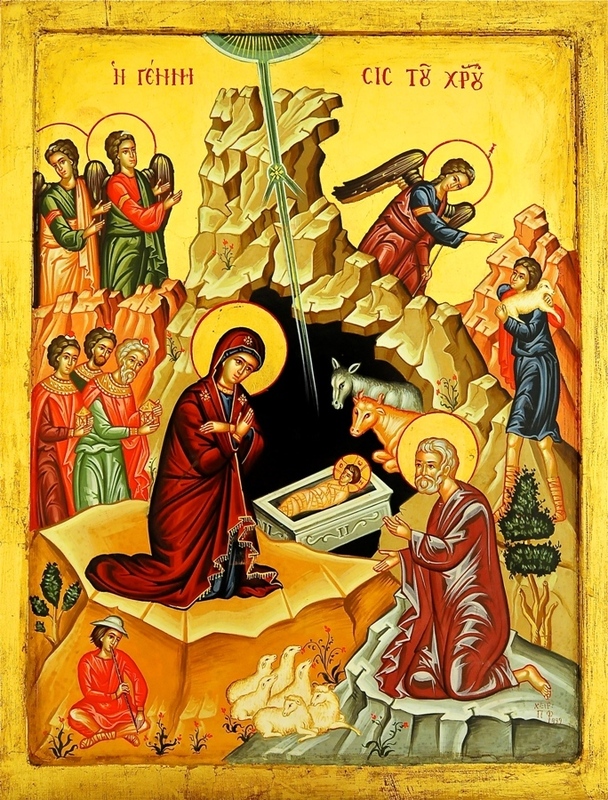 In this cave – on the night between Saturday and Sunday, on the 25th of December – the Most-holy Virgin gave birth to the Savior of the world, the Lord Jesus Christ. Giving birth to Him without pain just as He was conceived without sin by the Holy Spirit and not by man, she herself wrapped Him in swaddling clothes, worshiped Him as God, and laid Him in a manger. Then the righteous Joseph drew near and worshiped Him as the Divine Fruit of the Virgin’s womb. Then the shepherds came in from the fields, directed by an angel of God, and worshiped Him as the Messiah and Savior. The shepherds heard a multitude of God’s angels singing: Glory to God in the highest, and on earth peace, good will toward men (Luke 2:14). At that time three wise men arrived from the east, led by a wondrous star, bearing their gifts: gold, frankincense and myrrh. They worshiped Him as the King of kings, and offered Him their gifts (Matthew 2). Thus entered the world He Whose coming was foretold by the prophets, and Who was born in the same manner in which it had been prophesied: of a Most-holy Virgin, in the town of Bethlehem, of the lineage of David according to the flesh, at the time when there was no king in Jerusalem of the lineage of Judah, but rather when Herod, a foreigner, was reigning. After many types and prefigurings, messengers and heralds, prophets and righteous men, wise men and kings, finally He appeared, the Lord of the world and King of kings, to perform the work of the salvation of mankind, which could not be performed by His servants. To Him be eternal glory and praise! Amen. St. Ignatius, otherwise known as Theophorus, which in Greek means "God-Bearer," led the Christian Church during a critical period of her history. Pious tradition has always maintained that he was the little child that Christ held on His lap when he uttered the immortal words, “Let the children come unto me.” What is known for certain is that he grew up to be a disciple of the Apostles, St. Peter personally ordained him a Bishop, and his name is mentioned in the book of Romans. On December 12, the Holy Orthodox Church commemorates the memory of Saint Spyridon the Wonderworker. 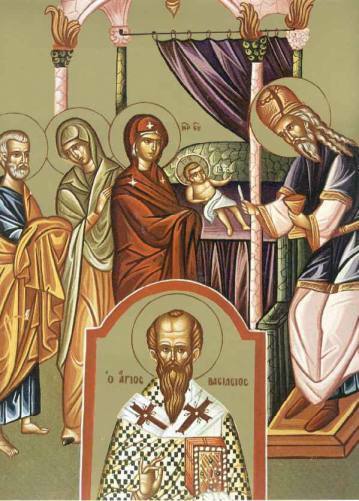 In his early life, Spyridon was a humble shepherd, married to a pious woman with whom he was raising a family. 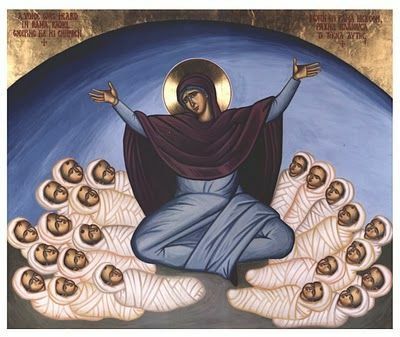 When his wife fell asleep in the Lord at a young age, Spyridon faithfully continued raising his children and caring for his flock. According to divine providence, Sypridon was elected and consecrated as the bishop of Trymithous, thus becoming a father to spiritual children and a shepherd to reason-endowed sheep. Despite the dignity of his new ecclesial rank, the saint continued in his labors as a humble shepherd. St. Spyridon is known as a Wonderworker because of the many and great miracles God worked through him. His prayers ended a drought, healed the sick, and raised the dead. He foretold future events, and discerned the inner thoughts of men. 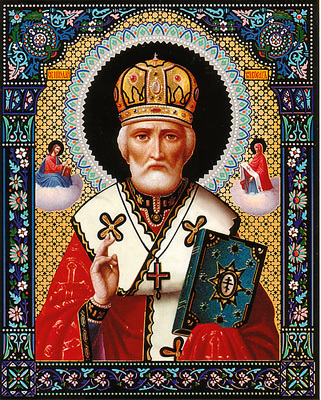 He attended the First Ecumenical Council of Nicaea, and although he was not a man of learning, he ably refuted the heretical sophistry of the heresiarch, Arius. In our contemporary times, there are those who read the Lives of the Saints with skepticism, doubting the accounts of great miracles. Many may read the life of St. Spyridon and think that it is full of legendary elements that could not possibly be historically true. Perhaps because the miracles are so wondrous, God left us a wonder to help us remain faithful – namely the incorrupt relics of St. Spyridon that reside on the Greek island of Corfu. 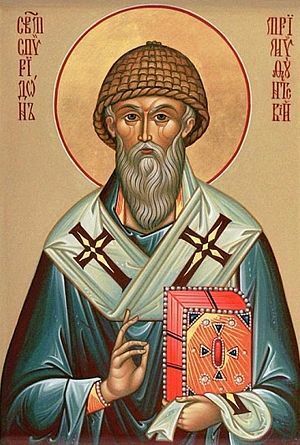 As hard as it may be to fathom, we can today see the incorrupt face of the man who argued face-to-face with Arius and fought alongside of St. Athanasius the Great and St. Nicholas of Myra. To this day, there are miracles that flow from those holy relics by the holy prayers of this saint. We celebrate this feast during our time of preparation for celebrating the Virgin Birth of the Son and Word of God. We are tempted to celebrate the feast in a secular way, concentrating our efforts on the decorations and gifts and forgetting to reflect on the wondrous nature of Christ's birth. The feast of St. Spyridon serves to remind us of the reality of the wonders God works in human history. We are reminded that there is nothing irrational (alogos) in our believing in the Word (Logos) taken flesh. We are reminded that the wondrous birth of Christ gave birth to the wonders worked by the Saints. We are reminded that God desires to give birth to wonders in our own lives – most importantly the miracles of repentance and sanctification. 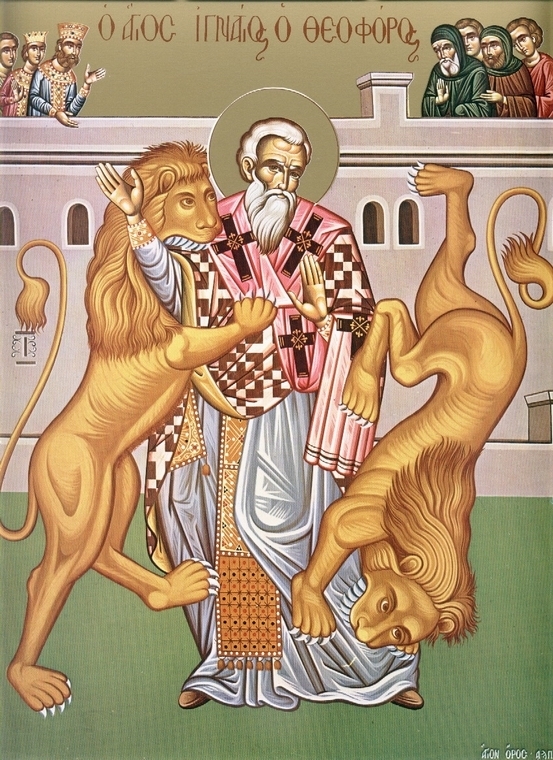 Thou wast a champion of the First Council and a wonderworker, O Godbearing Father Spyridon. Thou didst speak to one dead in the grave, and change a serpent to gold; and while thou wast chanting the holy prayers the Angels were serving with thee. Glory to Him Who has glorified thee; glory to Him Who has crowned thee; glory to Him Who through thee works healings for all.